Use pipes to summarize tree height data by plot stored in .csv format. 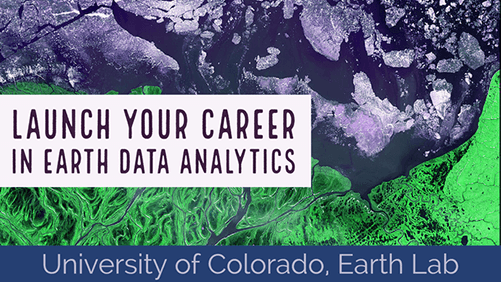 Merge a regular data.frame to a spatial data.frame object. Create scatterplots using ggplot() that compare 2 variables using a 1:1 line. In the last lesson you extracted canopy height data at each field site location from a NEON Canopy Height Model. 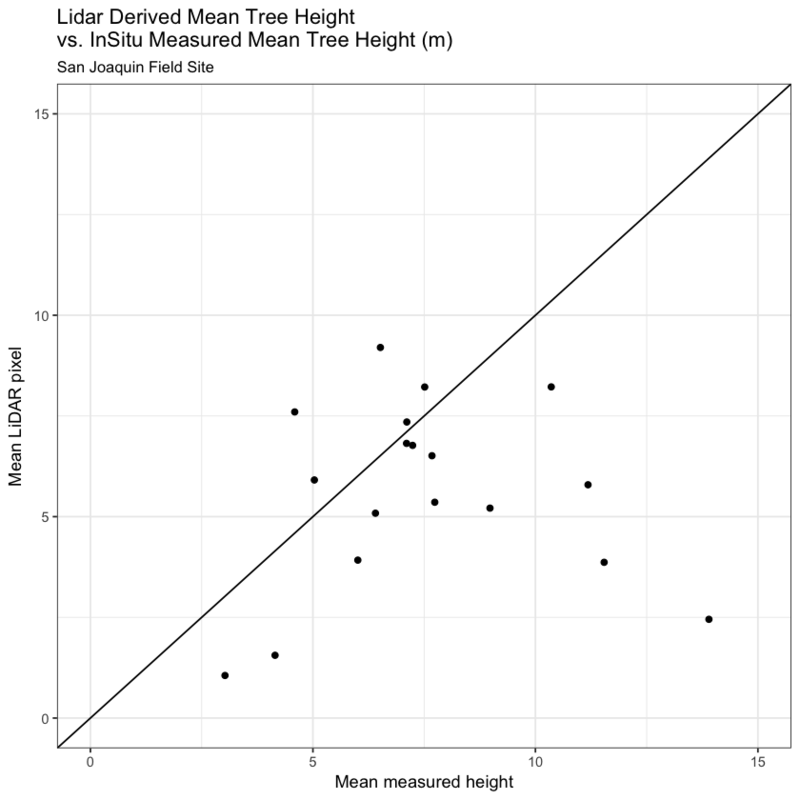 In this lesson, you will summarize your field site data so that you can compare tree heights measured on the ground with tree heights derived from lidar data. You will use the dplyr library to manipulate your data. 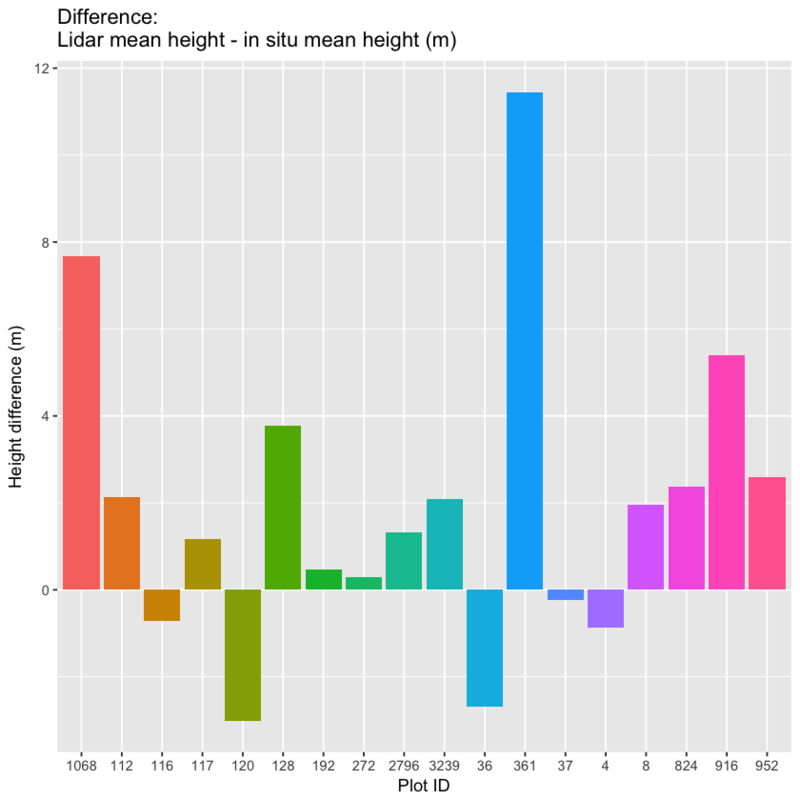 First let’s import and explore your tree height data. Note that your tree height data is stored in .csv format. How many unique plots are in the data? ##   "SJER128"  "SJER2796" "SJER272"  "SJER112"  "SJER1068" "SJER916"
##   "SJER361"  "SJER3239" "SJER824"  "SJER8"    "SJER952"  "SJER116"
##  "SJER117"  "SJER37"   "SJER4"    "SJER192"  "SJER36"   "SJER120"
##   "SJER1068" "SJER112"  "SJER116"  "SJER117"  "SJER120"  "SJER128"
##   "SJER192"  "SJER272"  "SJER2796" "SJER3239" "SJER36"   "SJER361"
##  "SJER37"   "SJER4"    "SJER8"    "SJER824"  "SJER916"  "SJER952"
# do you have the same plot numbers in both data sets? # are they the same ? In the field measured data, you have tree heights for each tree measured in each site. This is useful but really what your want is an average tree height value for all trees in that plot location. You need to summarise your data by unique plot id. In this case you need a mean and max tree height value for each plot. 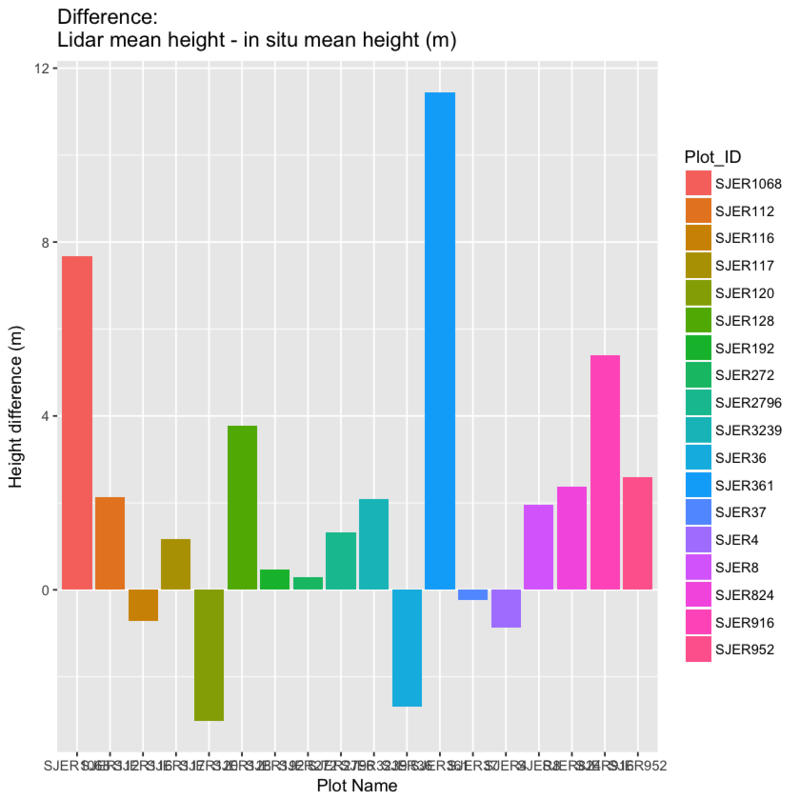 You use dplyr to extract a summary tree height value for each plot. In this case, you will calculate the mean MEASURED tree height value for each plot. This value represents the average tree in each plot. You will also calculate the max height representing the max height for each plot. 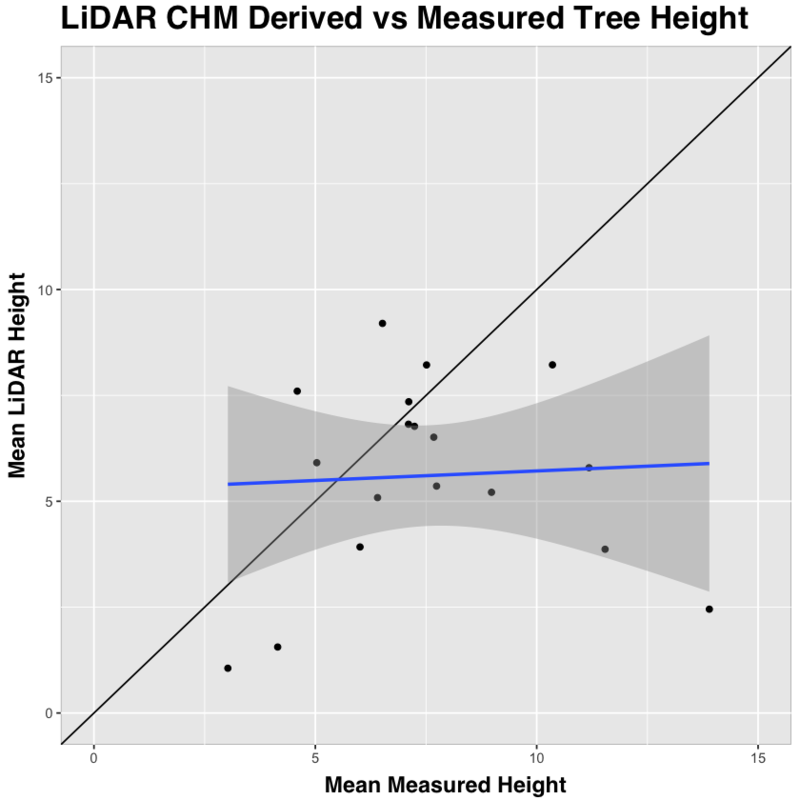 Finally, you will compare the mean measured tree height per plot to the mean tree height extracted from the lidar CHM. # view the data frame to make sure you're happy with the column names. you created two new summary fields using summarise. One field is called insitu_max and the other insitu_mean. Each field is populated with the max tree height value per plot and the mean tree height value per plot respectively. the name of the regular data.frames that you want to add to it. the column names that contains the unique ID that you will merge the data on. In this case, you will merge the data on the plot_id column. Notice that it’s spelled slightly differently in both data.frames so you’ll need to tell R what it’s called in each data.frame. In the previous lesson you renamed the lidar height field. Notice how now this makes your data.frame more “expressive” or easier to understand. Finally, create a scatterplot that illustrates the relationship between insitu measured max canopy height values and lidar derived max canopy height values. Next, let’s fix the plot adding a 1:1 line and making the x and y axis the same . You can also add a regression fit to your plot. Explore the GGPLOT options and customize your plot. Remove the legend from the ggplot and remove the site name from the plotid column. You will want to know how to modify a column for your homework assignment. The text that ou want to replace in quotes ""
What you want to replace that text with. To remove it use ""
The thing that you want to do the find and replace on. In this case that thing is the plotid column in your data.frame. You have now successfully created a canopy height model using lidar data AND compared lidar derived vegetation height, within plots, to actual measured tree height data. Does the relationship look good or not? 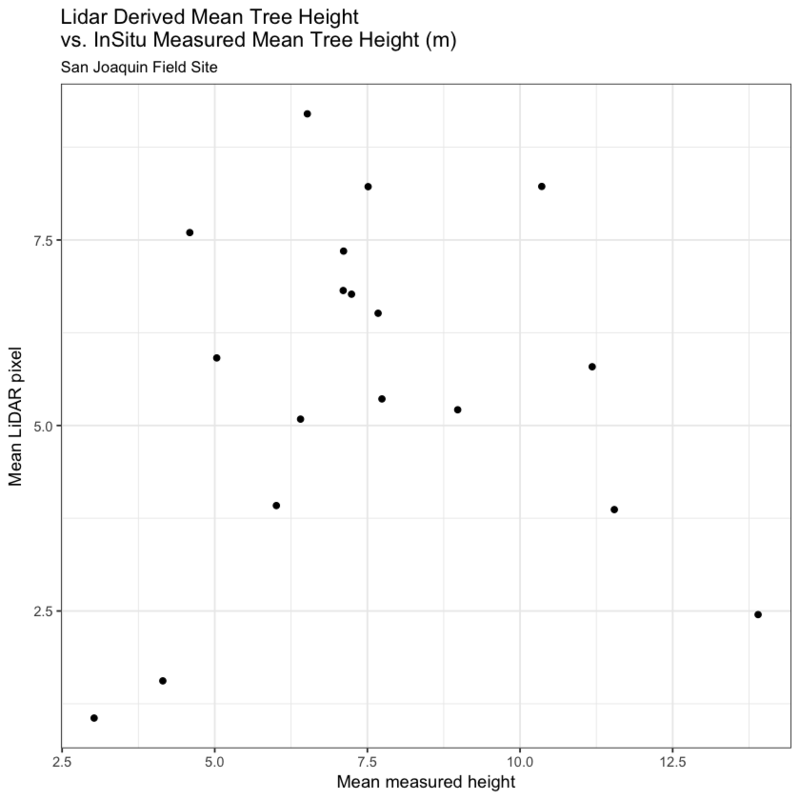 Would you use lidar data to estimate tree height over larger areas? Would other metrics be a better comparison (see challenge below). Create a plot of lidar max height vs in situ max height. Add labels to your plot. Customize the colors, fonts and the look of your plot. If you are happy with the outcome, share your plot in the comments below!